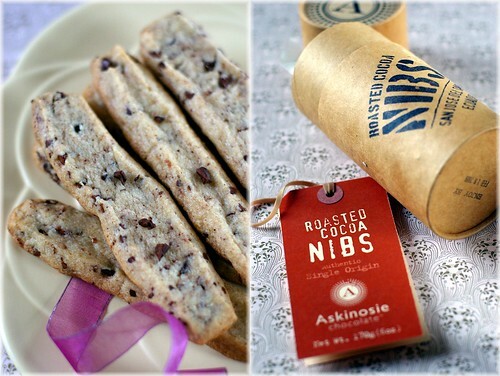 Fresh from the Oven: Almond Cocoa Nib Sticks and a Giveaway! Unlike some of my caring, thoughtful and meticulous friends, who have started Christmas baking and packing well ahead of time, I procastinate. I blame everything on the jetlag since I returned from Asia last Thursday.The horrible food on board, various transits and the long hours flights have zapped out most of my energy. All I want to do, is curling up on my favorite spot, drooling over the food photos on tastespotting and foodgawker and eating the snacks I sneaked in from Malaysia. One of the cookies I intend to make this year is Almond Cocoa Nib Sticks from Alice Medrich's Bittersweet.I have made them once to be sent overseas. Not only are they sturdy enough to withstand the potential abuse when mailed; according to OCT, they taste pretty darn good too. So good that he who usually doesn't like cookies can't stop munching them. I have to stop OCT from snatching yet another stick in order to have enough to fill up a box I need to send. The almond cocoa nib sticks are not as hard as biscotti but don't crumble as easily as shortbread cookies. They would be perfect by the side of a steaming cup of tea. Although OCT would add that it tastes just as awesome as it is-buttery, nutty, crunchy with a hint of cacao. And now, onto something fun- the Giveaway! 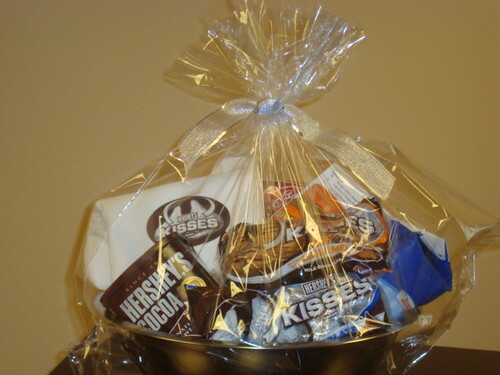 The good folks at The Hershey Company are offering to send 3 baskets full of baking goodies, which include: 2 varieties of Hershey Kisses, Peanut Butter, flour, brownie mixes, cocoa powder, spatula, mixing bowl and oven mitt to 3 lucky readers of Fresh From The Oven! All you have to do, is leave me a comment to tell me what's your favorite cookies for the holiday season. The deadline is 14th Dec, which is this Sunday. I will conduct a drawing on Monday morning, and 3 lucky readers will each receive a goodies basket, courtesy of The Hershey Company. The only catch? It's only open to US and Canada residents. My favorite cookie is a palmier. 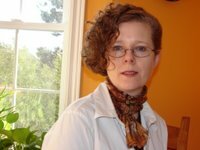 I've thoroughly enjoyed reading your blog! Keep up the good work! My all time favorite holiday cookie is linzer cookie.I love to pair the lightly sweetened and nutty cookie with jam to have a perfect blend of sweet and savory.It is just plain indulgence for me. Haha. Ooh, lovely biscotti! I wonder if they'll survive a trip to the Philippines, though-- it'll take about 2 months, lol. I know I can't join but I might as well tell you :) It used to be chocolate chip but now I have a new-found love of gingerbread! I like the sound of roasted cocoa nibs and of using them in cookies like these. My favorite holiday "cookies" (other that chocolate chip) are butter tarts. My favorite cookie at the holidays are peanut butter blossoms - they immediately remind me of the season! My favorite holiday cookie is Martha Stewart's gingerbread snowflakes...I make them every year for a friend's cookie party and they are a hit. Thanks for a great giveaway!! Those cookies look fantastic, and what a great giveaway! My holiday cookie of choice would probably be my mom's mystery cookies, which are something like Tollhouse cookie I believe but I have no idea exactly what's in them. Definitely oatmeal, toffee, and chocolate chips, and they're perfect warm and gooey. She used to make them randomly about once every four years (mom doesn't bake) and they were great. Oooh! My favorite holiday cookies will have to be barely-sweet gingerbread cookies! This year we're making them in the shape of dinosaurs and monkeys... go figure. I'm so far behind that I think I should start for next year at this point. How did Christmas creep up on me like this? My favorite Christmas cookie is sugar cookie cutouts--decorated with lots of frosting, red hots, chocolate chips, sprinkles, etc. There is something so relaxing about rolling out the dough, cutting shapes, decorating them, and then eating them after midnight mass. Sigh--even though it's just me and my hubby, I HAVE to make a bunch to eat with hot chocolate or tea. I think my favorite cookie of the season is Mexican wedding cookies, I make them for my relatives in the est every Christmas and they like to call them snowballs, lol. However i will also never decline a chocolate chip cookie, my fav! I agree with a previous commenter. The cutout sugar cookies are a holiday must have. Not only are they a delicious cookie but for many of us bring back memories of our childhood, making cookies with mom or grandma. Plus we can create wonderful new memories with our kids. They allow you to get as creative as you want and if you make a mistake you get to eat your failures! I stumbled across your blog and immediately subscribed :) So many great recipes on here - love how you say where you found them, but have modified them a bit :) Awesome! your baked goods always look delicious!! I think my favorite holiday cookie is the gingerbread cookie. I like its spiciness, something totally new to me! We never mix spices in our cookies, so I was really impressed the first time I tried this type of cookie. My favorite cookie, no matter what time of year, is always chocolate chip. Hmmm...chocolate dipped biscotti is awful good, but I also like molasses spice cookies. My favorite cookie is always shortbread! Inside-out chocolate-covered cherry cookies. I tried them for the first time last weekend and they are my new favorites. Love reading your blog :) I have used so many of your ideas/recipes - thank you so much! Yep, I'd have to go with chocolate chip. I never get sick of 'em. Thanks! Pizelles would have to be my favorite holiday cookie...light and crisp and I can easily eat a thousand of them. Not sure if those are considered cookies...if not, the second runner up is raspberry shortbread thumbprints. Yum. Your cocoa nib sticks look fantastic! Thank you so much for that cocoa nib stick recipe. Been thinking about it since I had returned the book to the library. haha. Will be trying this out soon. MY favourite cookie of the season would definitely be the non-descipt and awefully cliched gingerbread man! Cant' do xmas without them! haha. My favorite would have to be Milk Chocolate Florentine Cookies...sooo YUM! My favorite Christmas cookies are Coconut Macaroons. My mom makes such good ones! Good old chocolate chip are my favorite. I also love peanut butter cookies. I'll have to be boring and say that I LOVE plain old shortbread cookies at Christmas time! They bring back warm memories of making them with my mom. I'm definitely going to try this recipe. Looks great!! My favorite cookie is rugelach...yum! My favorite Christmas cookie is the peppermint pinwheel. As a kid I was always fascinated at the swirled slices - I still get excited when it's time to slice the rolled colored doughs! My favorite holiday cookie has got to be either Lace Cookies, or those Rainbow cookies from NY bakeries... the ones with 1 red, yellow and green layer, sandwiches together with jam and topped with chocolate.. MMMM holiday baking, i LOVE IT. Your Almond Cocoa nib cookies look absolutely delicious by the way! Those cookies look wonderful. Another recipe to add to my ever growing list of holiday cookies I have to try out. I have to say, my favorite holiday cookies are chocolate cookies with Andes mints melted on top. A delicious cookie that we only ever seem to make at this time of year. Sugar cookies! Always and forever!! Thanks for the chance to win such an amazing package of goodies! I've been reading (and drooling over) your blog for a few months now--Love it! My favorite cookie hands down are buckeye balls. I only allow myself to eat these at Xmas so that makes them extra special! My favorite cookie (& my family's) is a actually a bar form of Snickerdoodles! Love, love, love 'em! Thanks for hosting the giveway! My grandma's Springerle, which i tried making on my own for the first time this year. I think they turned out okay, but i won't know for another couple weeks as they age. chocolate chip cookies ofcourse!! lovveee to win the hamper. 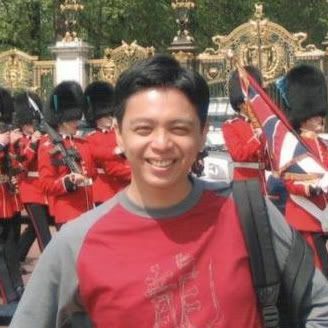 I just discovered your blog, it's fantastic!! My favorite cookie is an old Hungarian recipe, called "kefels" I don't think the spelling is correct but they are delicious! I think this cookie has many names, but we always called them ladyfingers....slender butter cookie with nuts rolled in powdered sugar. My favorite holiday cookie is rugelach. In fact, I'm making some today! My grandmother used to make biscotti, except they weren't really biscotti because they weren't twice baked. They were delicious though and she'd make an entire freezer full at a time. I miss those. My favorite cookie for the season is an oatmeal cookie with chocolate chips and nuts. It's hearty and perfect for the cold weather! 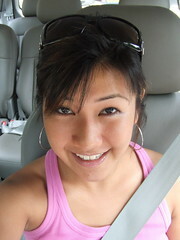 Mandy, long time didn't visit your blog. Yum, this is a recipe I definitely want to try, I think I am going to have to say my favorite is the good old sugar cookie, so yummy and so fun to decorate! Since finding the twice baked shortbread in Pure Desserts - Alice Medrich, I would have to say those are my new favourite. NIBS, NIBS, I'm baking some nibs, TONIGHT! i've made these before, and they truly were wonderful. what i love about to make for christmas cookies is rugelach. I would have to say the Snowball or pecan ball cookie is my favorite. my favorite cookie in christmas time its gingerbread cookie! cocoa nibs? i've never heard of them.. do you know where i can find some? my favorite holiday cookies are gingerbread men. you can decorate them in so many different ways! My favorite cookie is Ranger Cookies from Gourmet magazine. A combination of oatmeal, special k cereal, and chocolate chips. They are awesome. Decorated sugar cookies...so much fun to make and eat! My absolute favorite cookie has got to be World Peace Cookies or the famous Korova Cookie. I use white chocolate and it is beyond delicious! My favorite are home-made nut cresents... loving called sardine cookies in our house - because of the flecks the nuts make. All of my family, extended and otherwise, love them. Pfeffernuesse, no doubt. I'm hoping to try the real thing in Germany this year! My favorite cookies are soft chocolate chip cookies! Yum! My favorite Christmas cookies are spritz butter cookies(the tree shape) drizzled with white chocolate and decorated with colored sprinkles. Mmmmmm...it's almost time to bake! ur nib sticks look fabulous! My favourite cookie during the holidays is a ginger cookie. Linzer bars. Hands down. Pretty to look at and delicious to eat! Ooh lovely cocoa nibs! But my all time favourite is sugared cut-out cookies! Yeah! Honestly, they are a bit too sweet for me .. but I cant resist the lovely shapes & colours that is splattered all around them that makes the christmas & holidays truly enjoyable! BTW, I live in Malaysia but if I win, I would love to dedicate this lovely package to my aunt in Canada! A great recipe and beatiful photos to boot! My favorite holiday cookie is one my mom use to make (which I now make)...Toffee Squares. You press toffee flavored dough into a sheet pan, cook and when finish top with hershey bars. When the chocolate is melted, sprinkle with nuts, cool and cut into squares. Great with a big glass of milk! I love gingerbread cookies during the holidays, and decorated sugar cookies. I'm trying to bake 'different' recipes this holiday. Your Almond Cocoa Nib Sticks fit right into my plan! I look forward to trying your recipe. Thanks for posting! I love to make Sugar Cookies with my sons. I'd have to say my favorite Christmas cookie is sugar cookie cutouts. Gradma always had us kids help her make and decorate them and I still enjoy it. It's also fun to add to the cookie cutter collection. I love chocolate crinkles! Love them!! pecan crescents - though i usually make them as balls. and hershy's peanut blossoms are always delicious. I love Nan's Bars this time of year. Yum! Coffee and cookies. It doesn't get much better. What a *sweet* give-away! My favorite holiday cookie is chocolate-dipped coconut macaroons. They're positively addictive. We are so missing you back in STL. Of course we also miss OCT. 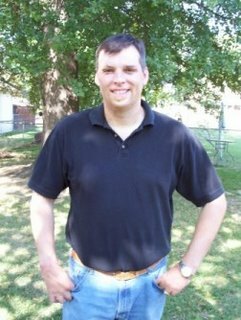 I've enjoyed visiting your blog every now and then to somehow stay connected. My favorite holiday cookie is a home-made peanut butter cookie that we used to get as a gift from a family friend back home. It was one of the treats that signified that the holiday season had arrived. My favorite holiday cookies would be gingerbread cookie. My favorite cookie is a peanut butter cookie- I also love chocolate peanut balls. My boyfriend's family always makes them at Christmas, and they're always the first thing gone! My favorite is pumpkin spiced cookie. I love homemade biscotti and one of my favorite recipes in my box is for a triple chocolate biscotti that is just yummy. My favorite holiday cookies are chocolate chip cookies. Hands down its Spritz cookies. Very cool site -- my sister-in-law intro'd me to this. My favorite cookie is a soft, warm chocolate chip cookie. My favorite has to be the gingerbread cookies. My favorites are a cinnamony-nutmeg recipe that my family calls Betsy cookies. They're delicious, iced or not, and cutting them out is one of my favorite memories of childhood Christmases. Christmasses? My favorite christmas cookies would have to be snickerdoodles! i am normally a chocolate fanatic but there's something about cinnamon and sugar that strikes me as very christmassy and festive! My husband is from Czech and we love the traditional Vanilla Crescents (Vanilkove Rohlicky) and Beehive cookies at Christmas! My favorite is probably snickerdoodles. Thanks for the chance! 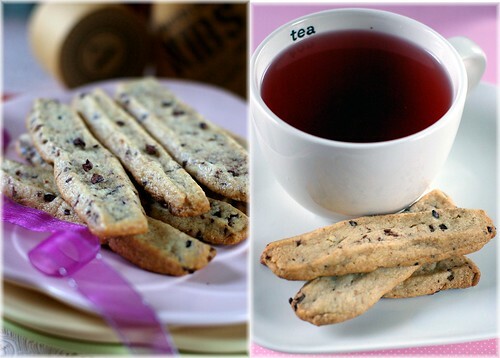 Really yummy-looking biscotti! I wanna try it soon! My favorite cookie is the good old Oatmeal Raisin. However, during the holidays one year my wife made some Snickers based cookie that were fantastic. Basically it is a cookie made with a cake mix and then one puts a bit of a Snickers into the middle. The Snickers coats the cookie and it is oh so good (I sound like Mr. Food). Your biscotti look amazing! I want to try them. My favorite cookie is white chocolate macadamia nut... the bits of white speckled through a beige background of butttery cookie... nothing beats it! My favorite cookie is linzer cookie with chocolate instead of jam. I haven't started my holyday baking either, just arrived from vacation yesterday. I have to start soon. Your sticks are lovely! I am a big fan of shortbread! Thanks for the chance. I love really good sugar cookies that melt in your mouth with a buttercream frosting. The cocoa nib cookies look perfect for sending to friends for Christmas! My favorite during the Holidays was: Chewy Chocolate Gingerbread Cookies. This is a nice giveaway. Those are really yummy sticks. I just made some and my kids loved it.